We asked Louisa Demmitt, an instructional designer for Interweave, to tell you about a distinctive way to knit sock toes. Here’s Louisa! The time of year for knit socks is upon us. Toe-up, cuff-down, however else you might make them, warm feet make everything better come wintertime. Andrea Wong’s look at Portuguese Socks from the Alentejo region of Portugal in the January/February 2017 issue of PieceWork is a beautiful story of colorwork and tradition. The socks, knit by Doña Maria Felismina Pereira, are inspired by beautiful historical motifs, but the toe shaping is what I want to focus on here. The “Portuguese Spiral Toe” is created through shifting decreases throughout the toe shaping. It’s not a complicated process, but it’s quite unique and creates a distinctive look. The miniature stocking pattern Andrea wrote includes this toe shaping as well as an interpretation of the floral motif and stripes of the traditional socks. This mini-creation is the perfect place to start learning about colorwork in sock knitting as well as how to master the Portuguese Spiral Toe! We all have different approaches to socks and end up favoring different techniques and tricks. But socks are a great way to branch out and try new things because they are not too much of a commitment of time or yarn! If you don’t fall in love with alternative options that’s completely okay, but at least you got out of your comfort zone and tried something new. Plus making patterns like this helps to keep traditions alive and thriving, which is always a good and necessary pursuit! Check out the entire issue to read more about the history of sock knitting in Portugal, as well as to find the pattern to make a stocking of your own. 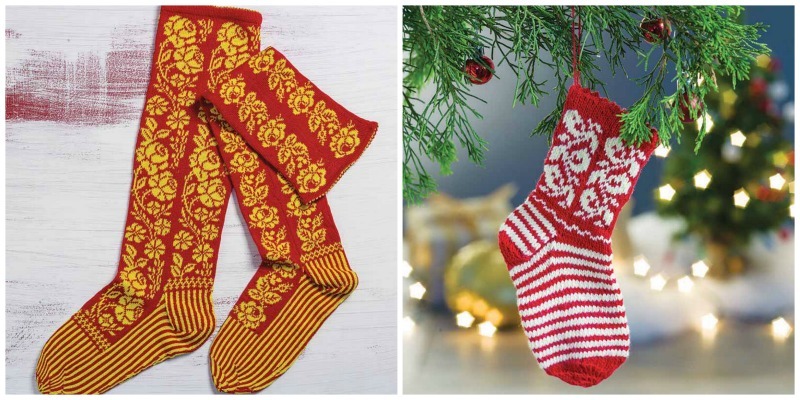 Featured Image: Left: Doña Maria Felismina Pereira’s stunning traditional knitted Portuguese socks. The socks are similar, but they are not a pair. Photos by Joe Coca. Right: Andrea Wong’s miniature stocking with a Portugeuse Spiral Toe. Purchase PieceWork in our shop!